There are always a few teams that are out of kilter with the league draw average figures. The results of some of these teams, no matter which season is analysed, are well below the league average and bookmakers have no other choice than to set their odds in a way that their books are fairly well balanced without coming too close to the true distribution of these teams. Followers and supporters of betting systems will find including such teams in their lay bet portfolios excellent long-term value. For example, in any of the last five seasons you will find no more than a maximum of two drawn league games involving Manchester United playing at home. In fact, during 2012-13, there was not a single draw in the 19 league matches played at Old Trafford. Of 95 home games since 2008-09, only six of United’s fixtures finished in draws (6.32%); this converts into betting odds of 15.8 (the ‘zero’ or ‘break-even’ odds). However, there is no way that bookmakers will ever offer odds week in, week out, at or around 15.8 for United to draw at home. The majority of bettors would not be tempted to back the draw if it were advertised as the rank outsider in every match and the bookies’ books would remain unbalanced. This is obvious. Therefore, the draw odds for Manchester United home matches averages around 5.45; ideal for a laying system as these odds hold a long term mathematical advantage of 233%. For teams such as Manchester United, where normal statistics do not really apply, bookmakers prefer three different approaches. In the above image, the Manchester United vs Fulham H2H encounters from the last 10 years did not show a single draw. As a result, the true betting odds should have been in the region of 11.1, far too high to be attractive for the average football betting punter. Therefore, the draw odds were based on the last 25 games and set at 5.7. The match finished 3-2. In the Manchester United vs Everton match the true draw odds calculated to 3.23. A short draw price might seem very attractive for the sports bettor, but for the bookmaker it is risky, as odds at the true odds figures would attract too much money placed on the draw and not enough on Everton to win. Therefore, the bookmakers side-stepped this quandary by orientating the draw odds around the league average from the previous season, at the same time reducing Everton’s odds to attract bets on them. The result of this match was 2-0. In Manchester United v Chelsea the true odds were roughly the league average of the previous season, but the H2H results between United and Chelsea at Old Trafford in the last 10 years produced 28.57% draws. The bookmakers therefore preferred to orientate the draw betting odds around the H2H results. Chelsea won the match, 0-1. According to the models and explanations in this article it is not difficult to conclude that Laying The Draw in Manchester United home games is worthy of inclusion in your betting system portfolio, but all other teams in the EPL are far less attractive from a laying the draw perspective. It should now be clear that even if odds set by bookmakers rarely coincide with the calculated true odds, it does not necessarily mean that higher market odds than the calculated true odds never hold long-term lay value. Identifying value lay bets depends on the performance of the individual team within their league (e.g. Manchester United vs Everton where the true odds were far below the draw odds offered by the market). In order to develop a working lay the draw strategy, you will need to identify the teams which produce consistently less draws than the league average, and then look at their individual statistics closer to weigh-up whether or not their draw trend is likely to continue. Another important point is that although I have used Manchester United as example, laying the draw does not apply just to the perennially successfully teams. The choice of the English Premier League and Man Utd in particular was a personal one. In Denmark, for example, a team from the mid-regions of the table is a lay the draw candidate, and in the German Bundesliga there is one team in the top half, but neither Bayern nor Dortmund. If you wish to develop your own strategy, the Soccerwidow’s HDAFU simulation tables are an excellent starting point. Our HDA Profit/Loss Simulation Tables for betting on 1×2 results are based on the highest bookmaker odds, and include “odds toggles” to level the odds down to the odds you are buying (i.e. you are not achieving high enough odds on a consistent enough basis). The tables calculate profit and losses for systematic betting on the home, draw or away from the last five complete seasons so that trends and patterns can be easily spotted as well as teams which are regularly over- or under-priced. The summary tables will show promising teams at first glance and also identify the teams which are likely to produce a loss in the long run. 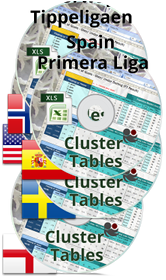 The traditional home, draw, away analysis by teams is supplemented by a complete overview of the favourite and underdog markets, plus simulations by Odds Clusters and Odds Ratios (the four best ratios for clustering results). The tables also include inflection point analysis, and the Half Time Tables the 0:0 at HT. The HDA Tables are a must have for development of profitable betting strategies.